This is a full day of Nairobi covering Nairobi National Park, Daphne Sheldrick Elephant Orphanage, Giraffe Centre, Lunch at Carnivore Restaurant and a Visit to Bomas of Kenya. Pick up from your hotel and drive to Nairobi National Park, only eight miles from the city center. Wildlife roams this magnificent Park, which provides an excellent opportunity for photography. Nairobi National Park is a unique ecosystem by being the only protected area in the world close to a capital city. The park is located only 7 km from Nairobi city centre. The savannah ecosystem comprise of different vegetation types. Open grass plains with scattered acacia bush are predominant. The western side has a highland dry forest and a permanent river with a riverine forest. To the south are the Athi-Kapiti Plains and Kitengela migration corridor which are important wildlife dispersal areas during the rainy season. Man-made dams within the park have added a further habitat, favorable to certain species of birds and other aquatic biome. 1045Hrs: Depart and Drive to Daphne Sheldrick Elephant orphanage in time for feeding the elephants (feeding starts at 1100 Hrs for 01 Hour). Get ready to come close to elephant calves! 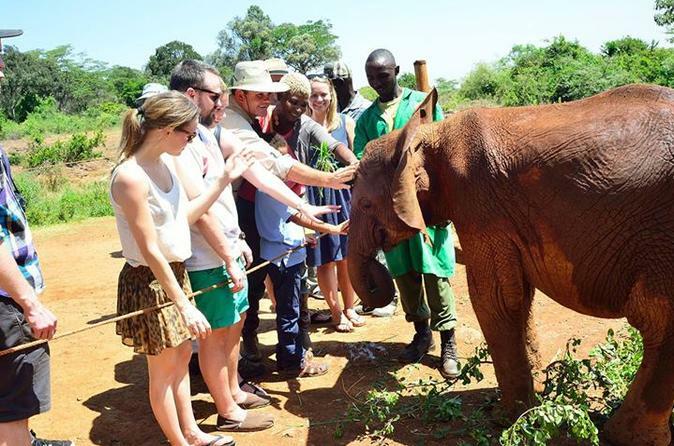 As part of the David Sheldrick Conservation Foundation, Daphne Sheldrick rehabilitates baby elephants and other wildlife here at her home just outside of Nairobi National Park. These babies have lost their mothers to poaching, death, injuries, on getting lost in the wild or other tragedies. Daphne and her dedicated staff raise them to be released back into the wild when they are ready. I'ts worth visiting to see humanitarian care of the wildlife and the heart it takes to care. There is a small entrance fee which can also be paid through purchasing a souvenir or donating to the conservation. 1215 Hrs: Drive to giraffe centre and experience feeding giraffes. Since the Giraffe Centre’s founders Jock and Betty Leslie-Melville rescued a baby giraffe named Daisy from a heavily-poached area of western Kenya in 1974, their home has become a household name among wildlife lovers world-wide and Daisy a star in her own right. 1300 Hrs-Lunch will be provided. 1430 Hrs-Drive to the Bomas and enjoy the great Kenyan diverse cultural houses and dances. Bomas of Kenya is an interesting tour to learn about the diverse cultures that make up Kenya. 1700 Hrs: Drive back to your Nairobi Hotel.